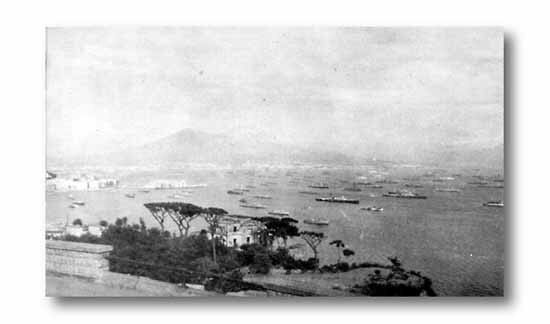 For eight months of the Italian campaign Naples, disfigured and dirty, remained the only major city in Italy to be liberated, the only playland for soldiers on combat recess. Here American troops came to sightsee, shop for gifts, drink wine, and meet Italian girls. ONE OF THE MOST FREQUENTED spots on the Via Roma is the Galleria Umberto. In the interior are the more exclusive jewelry, painting, and wine shops. 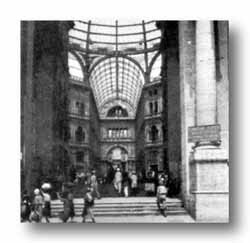 Bombing severely damaged the Galleria's glass dome. above, Naples street scene shows some modern shops. Using the leading thoroughfare of Naples for his title, Pfc. Jon Forte, 36th Division bandsman, wrote a song that became a favorite with the troops --- "Somewhere on Via Roma." And there it was, it had to be! She was indeed a lovely dream. Softly she whispered words of love to me. She said 'My heart will go away. In Napoli, where songs are of stars above!